The future is once again rosy for UK boxer Ricky Hatton after his stylish and, for once, disciplined victory over Paulie Malignaggi in Las Vegas on Saturday night. After being comprehensively outclassed by ‘Pretty Boy’ Floyd Mayweather Jr. in his last fight, Hatton’s first defeat as a professional, the match up with New Yorker Malignaggi was a true make or break for the Manchester fighter. Having failed to recreate the form that saw him defeat Kosta Tszyu in 2005, many of Hatton’s recent performances have raised doubts about his future in the sport. The fighter is well known for a love of pies and Guinness between fights that sees his weight baloon by as much as 3 stones. This has lead to many pundits predicting Hatton’s lifestyle has already taken its toll and that he will never be the same fighter he was at 26 or 27. But Hatton is only 30 years old in a sport which has seen success for many older fighters. Joe Calzaghe is arguably the best pound-for-pound fighter in the world at the moment at the age of 36, but he was lucky to get a split decision over the 43 year old Bernard Hopkins. Oscar de la Hoya, a potential next opponent for Hatton, is as dangerous as ever. Although, it could be argued that it is the discipline of these fighters which has prolonged their careers. This is the discipline which Hatton has lacked. This weekend though, the old Ricky Hatton returned. And boy were we glad to have him back. For the last 8 weeks Hatton has been trained by Floyd Mayweather Sr., the father of the only man to have beaten him. 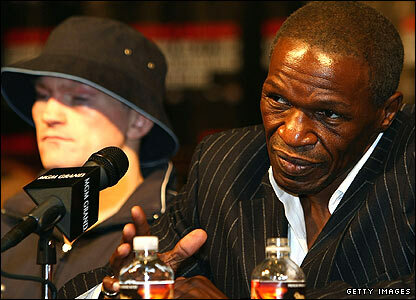 As one of the most highly regarded coaches in the world, Mayweather Sr. was always going to be a good appointment. He studied Ricky’s early fights and contrasted them with his more recent ones. What he found was Hatton reverting to more of a slugger in his latter fights, standing toe-to-toe with his opponents like a bar-room brawler instead of using the boxing skills he had been so successful with in his earlier career. With only 8 weeks to work with Hatton before the Malignaggi fight, Mayweather Sr. focussed on Hatton’s defence, citing a lack of head movement; something which proved his undoing against a class act such as Mayweather Jr.. In Saturday’s fight Hatton showed his old boxing skills and a much improved defence. Malignaggi was never expected to knock Hatton out (his record shows just 5 wins by knockout in 27 fights), but his hand speed was expected to provide a stern test for Hatton’s suspect defences. The first 2 rounds were close, but Malignaggi’s jab came out on top. From then on though, Hatton took over and never lost another round. His defence was tight, his head movement excellent and he threw some punishing overhand lefts. At one point in the 5th Malignaggi was hit by a crushing blow which would have sent him to the canvas, had he not fallen forwards into Hatton, who unwittingly kept his opponent up. 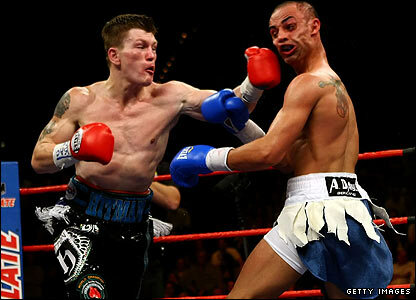 What surprised most pundits at the fight was that from round 3 onwards, Hatton even managed to out-jab his opponent. Eventually, Malignaggi’s corner decided they had seen enough and threw in the towel in the 11th round. With nothing much coming back and their fighter way behind on points, they took the decision that Malignaggi would not have made. The New Yorker was furious at the decision, even pushing his trainer in the chest after the fight. Malignagi is a proud fighter who had never been stopped before. His only previous defeat come on points against hard-as-nails Puerto Rican Miguel Cotto; a fight in which he sustained a broken hand and a broken jaw, but still fought to the end. The decision to end the fight looked premature. But, as his corner said afterwards, better to end a fight too early than too late. As game as Malignaggi undoubtedly is, sometimes a fighter just doesn’t know when to quit. This though, was the Hatton of old. Promoter Lu DiBella said he thought Hatton was possibly better than ever before, but this is more than likely an attempt by him to retain some interest in his fighter Malignaggi, who looked way out of his depth and was ultimately disappointing. This was of course in part due to Hatton’s performance, which showed less of the hot-headed approach of recent fights and instead replaced it with a calm, controlled performance. What next for Hatton though? Having previously stepped up to 147lbs only twice and struggled badly (one laboured win and his comprehensive defeat to Mayweather Jr.), Hatton said he would be staying at Light-Welterweight. But the big fights and the big money occasions are likely to be at 147lbs and not 140lbs. keen to make the match, as is Hatton. The prospect of an 80,000 crowd in the UK is enticing to both fighters. It has been estimated that ticket sales alone could generate nearly £30m, and there is then the pay-per-view slaes from both sides of the Atlantic to factor in. It would undoubtedly be the biggest money making fight the UK has ever seen. 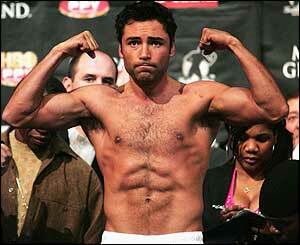 One problem though: de la Hoya has first to get past his next opponent – Filipino Manny Pacquiao. ‘The Pac-man’, a four-weight world champion himself, is rated by Ring Magazine as the top pound-for-pound fighter in the world and represents a significant challenge to de la Hoya. However, as a former lightweight, the challenge of stepping up to Welterweight may well be too much, even for a fighter as determined and skilled as Pacquaio. If de la Hoya gets past Pacquaio, then the scene will be set for a showdown with Hatton which could break attendence and pay-per-view records. The record for both is currently held by de la Hoya and Mayweather Jr. for their 2007 fight. Hatton, whilst only 30, may well only have two or three fights left in him, so he’ll be looking for the big pay days to fund his retirement. But Hatton had better get in there quickly; with this type of money being thrown around, what price would we get on Floyd Mayweather Jr. coming out of retirement for another pop at de la Hoya?